A SIGNPOST IN County Clare has been given “State-protected status”. The signpost in the centre of Ballyvaughan had been the focus of a row between the National Roads Authority, Clare County Council and local people. 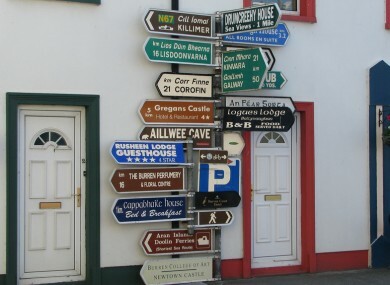 The post, cluttered with signs to various local beauty spots and tourist attractions, had previously featured in Tourism Ireland campaigns and was considered a local landmark. However, the National Roads Authority had decided this summer that the clatter of signs were a motoring hazard. It then emerged at the weekend that the NRA did a U-turn and offered to reinstate the sign – but that Clare County Council had refused the offer. The whole furore around this has re-awoken a sense of local community in the region and better engagement in the agencies. However, tourists hoping to snap the iconic signpost in all its former glory will have to wait. The NRA had stripped it of all but placename signs – although the council’s decision will allow the old signage to be reinstated. Email “Iconic tourist signpost to be reinstated”. Feedback on “Iconic tourist signpost to be reinstated”.